Chicago celebrates with a green river, Seattle paints its roads green, and San Franciscans will be searching for green beer in pubs all over the city. St. Patrick’s Day is coming up and if you haven’t found your “something green” or if green just doesn’t look good on you but you still want to be festive, here’s an idea — eat your green! Join the green theme and put together an all-green meal for a St. Patty’s Day party or for the family. This may be the one time of year when you don’t have to try too hard to get your kids to eat their veggies. 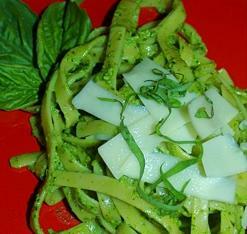 We’ll get you started with our GREEN Fettuccine with Arugula-Walnut Pesto and Shaved Asiago recipe. Use spinach or any other green-colored fettuccine and you will have a wonderful belly full of green ready to absorb all that green beer to follow! Serve: Spoon pasta onto a pasta plate. 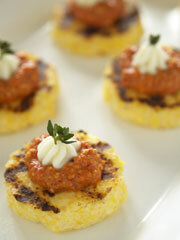 Garnish with shaved Asiago, basil and walnuts. Serve immediately. Serves 8 as first course.